O apartamento está localizado em Armação de Pêra no Algarve Central. O apartamento é virado a praia e da longa praia de areia possui muitos restaurantes fantásticos. A localização é ideal para famailies como é curta distância de dois parques aquáticos eo Zoomarine. A 10 minutos de carro também vai levá-lo para o famoso "Algarve Shopping Centre", onde há estacionamento gratuito, lojas para todos, uma praça de alimentação e um cinema. No caminho para o centro de compras que você passar uma aldeia chamada Guia, onde pode saborear o famoso "frango piri piri", que é muito popular com os moradores e turistas. O apartamento também beneficiaria todos os entusiastas do golfe, com campos de golfe de apenas 8-10 km de distância. O aeroporto de Faro é de aproximadamente 45 minutos de carro. Família casa de banho com banheira / duche, bidé e wc. Notas sobre alojamento: O apartamento é de frente para praia com um longo balcão situado fora da sala e do quarto de casal que tem uma vista espectacular sobre o mar ea praia dourada. O salão tem ar condicionado, 42 "tela de plasma com TV via satélite e um DVD Player. O quarto duplo tem portas que se abrem para a varanda eo quarto twin tem uma grande janela que permite a entrada de uma brisa encantadora para os dias quentes. Por razões de segurança não são operados persianas para todos os quartos manualmente. O apartamento fica no sexto andar e há dois elevadores. Nós pedimos que não há fumo no apartamento no entanto, é permitido na varanda. Lado de fora: Há um encantador pátio em frente do apartamento. Serviço de limpeza / toalhas / linho / empregada doméstica: Toalhas e lençóis são fornecidos. Propriedade é limpo semanalmente que inclui toalhas e roupa de cama. Limpeza adicional pode ser fornecida se aplicará encargos exigidos no entanto extra. De outros: Baía de estacionamento localizado no subsolo. A very comfortable and well located apartment. I stayed at the apartment for one week with my wife and two adult daughters. The property is very comfortable, has exceptional views of the sea and beach and is very well equipped. Being a short drive from the airport, the transfer is easily achieved by taxi or as we did, by hire car. The resort itself, whilst busy when we stayed was very laid back and had such a wonderful, friendly atmosphere at all times of the day. We drove to and enjoyed various places on the Algarve during our stay but also spent several very relaxing afternoons and early evenings on the beach. With plenty of restaurants to choose from, we experienced a variety of culinary delights, served by friendly staff and also enjoyed the various street performers on the main promenade. During the booking process we found both Dharms and Birju to be extremely helpful in all manner of questions we posed in preparation for our holiday. I would have no hesitation in recommending this apartment and will be returning next year. This is the 2nd time we've stayed in the apartment. No issue with hot water this time as now has a lovely new boiler. Owners lovely to deal with and booking completed very smoothly. The apartment is in a great location and really does have everything you need for a self catering holiday. I'm sure we'll be back in the future. I am a frequent visitor to the beautiful town of Armacao de Pera. The apartment location could not be better in my opinion. The beech is across the road, there is a great communal pool just around the corner if you want a change and all the restaurants and bars are within a 5 minute walk. Dharms was an absolute pleasure to deal with and was extremely efficient in all communications. The apartment has an amazing view of the beech and sea from the balcony which was perfect for enjoying a glass of wine before going out. It had all the mod cons that you would need and was very well kept. I would have no hesitation in recommending it if you are looking at a trip to Armacao. We had a great holiday at this apartment. Many times we sat on the balcony looking down over the wonderful sandy beach and listening to the waves! Magical!.The apartment was bright and smart and had everything we needed. The location is wonderful. The beach is right there opposite the apartment and there were three bar/restaurants on it. There's a lovely café/cake & ice cream shop called Busiris yards away that you can get cake, coffee, drinks & ice cream from until about 11 or 12pm. Really nice overall - thoroughly enjoyed it all. Had been worried about the hot water issue somebody had mentioned in a review but the owner told me he had replaced the boiler system and all would be OK. So it was, hot water whenever we needed it. The owner was great to deal with too - attentive, kind & considerate. Stayed in this lovely apartment for a week, great views of the sea and very close to the beach restaurants and shops. The apartment was well equipped and had everything we needed. The owners were great to deal with and answered any queries promptly. Wouldn't hesitate to stay here again. Would have had 5 stars but we did struggle a bit with the hot water but this was sorted out by allowing the water to heat up again between showers. Certainly wouldn't put me off booking again as I'm hoping we will be booking again for next year! Have had 2 wonderful holidays in this apartment June and October. 2 good sized bedrooms - the main bedroom had patio doors to the south facing balcony which was lovely to lie in bed looking out to sea. The sitting room also has patio doors to the balcony and this room has air conditioning for those very warm days when the sun pours in. Having just returned from 2 weeks in October and the sun being lower in the sky the balcony got the sun from about 10.00 in the morning and it was beautiful sitting out there and watching the sun set early evening. The kitchen, albeit a little on the small side, has everything you could wish for to make your holiday hassle free and anyway who wants to spend time in the kitchen cooking when there is a fabulous Chinese restaurant called Happy Talk next door to the apartment building and 2 minutes up the road is the Indian restaurant called the Raj. The location of the apartment means you do not have to hire a car if you don't want to - its about a 5 minute leisurely walk into the heart of Armacao De Pera and the beach is opposite the apartment across the road. A 8 km longa praia de areia dourada está situado mesmo em frente ao apartamento. 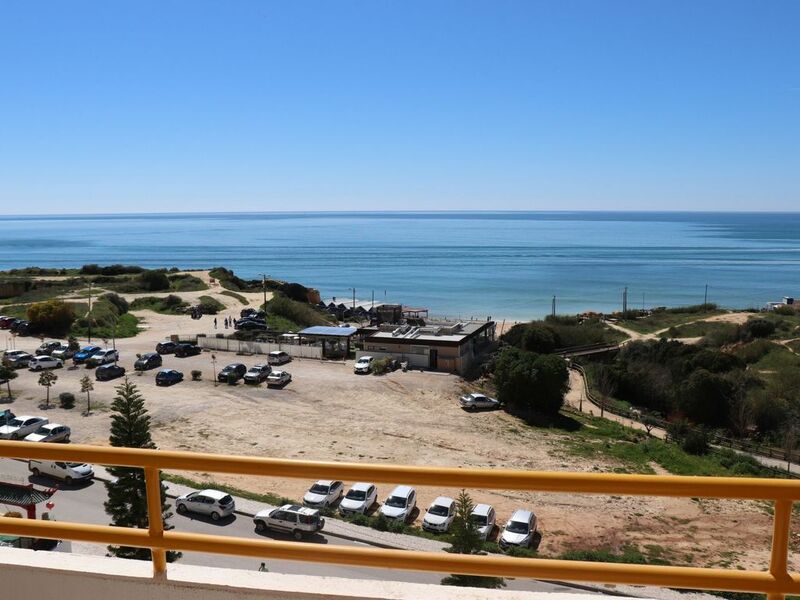 A seção de praia em frente ao apartamento tem 3 restaurantes com mais localizado mais abaixo na praia. Há uma facilidade para contratar espreguiçadeiras na praia, bem como muitas actividades náuticas. O Aeroporto de Faro está a 45 minutos de carro. Alugar um carro é disponível a partir do aeroporto e com o apartamento que tem sua própria baía de estacionamento subterrâneo, estacionamento no calçadão da praia não é um problema. A principal faixa de Albufeira está localizado a aproximadamente 11 km de distância. A famosa cidade de Portimão fica a aproximadamente 15 km de distância. A principal marina de Vilamoura fica a aproximadamente 25 km. Supermercados locais estão a uma curta distância, bem como Bancos / ATMs. Há muitos restaurantes e bares localizados a poucos minutos do apartamento de catering para uma ampla gama de sabores, incluindo indiana, chinesa, italiana, bem como uma série de restaurantes que servem pratos portugueses autênticos feitos com peixe fresco, que é o que a cidade é conhecida para. Aproximadamente 400 jardas para a parte antiga da cidade, a área é pedestre e há muitas barracas com música ao vivo tocada em uma base regular. Também abriu recentemente são 2 adorável sorveterias com uma grande variedade de sabores em oferta. As praias oferecem muitas atividades de água e você pode alugar espreguiçadeiras ou tomar o seu próprio. Os restaurantes na praia servem uma variedade de alimentos que vão desde pratos autênticos portugueses, para sanduíches, batatas fritas etc. Zoomarine e parques aquáticos são também muito perto e são muito populares entre as crianças. Mas se você quiser realmente explorar mais longe, em seguida, a principal capital de Lisboa é apenas uma unidade de três horas ea fronteira Espanha é apenas uma 2h de carro. Existem estradas com portagem, que são fáceis de usar e de condução sobre eles é bastante para a frente ou você pode usar as estradas do país desde que tenha mapa / navegação por satélite na mão. Booking Notes: Direct with the owners. A 30% booking deposit is required to secure the booking, with the balance due 8 weeks before start of holiday. Sorry no pets. Breakages to be replaced or paid for. The following are available at an additional cost: Transfers and welcome pack, cot & high chair. Changeover Day: Flexible changeover day. Notes on prices: Shorter stays available on request. Please contact the owners with dates and duration required. Long term winter bookings accepted. Please contact for info.